Posted on July 20, 2015 . The whole Marc Jacobs Beauty range is so beautiful and intriguing I always have multiple items on my need-to-try list. Last time I reviewed (raved about) the #Instamarc contouring duo so I guess it’s about time to share my thoughts on another item I purchased from the range at the same time. 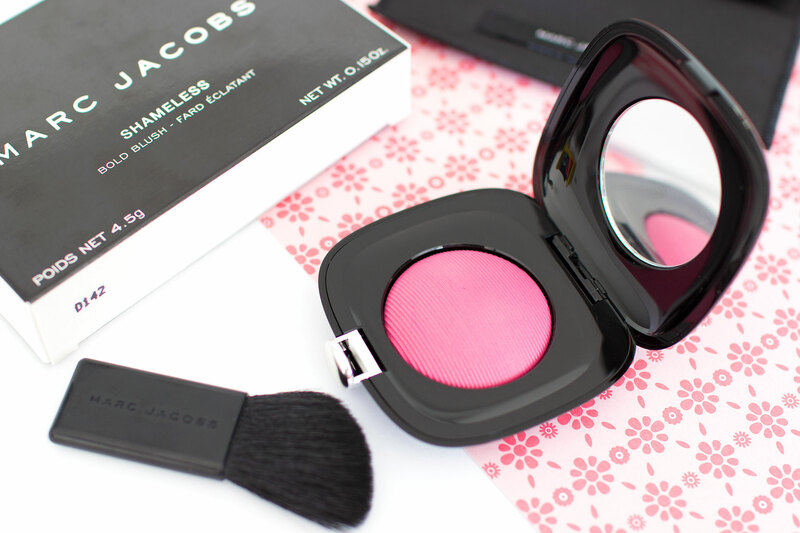 Apparently, “Marc Jacobs Shameless Bold Blush is a vivid, silky blush in a stylish compact that delivers bold color and unprecedented vibrancy.” and I couldn’t agree more. The packaging really looks very sleek, modern and luxurious. The compact comes in a stylish pouch which also includes a very usable brush. I think it’s a bit thin to actually apply a blush properly but I love using it for a strong contour or highlighting. The product itself seems a bit small but actually it’s the same weight as NARS blushes (for a very similar price too). I had a hard time choosing the shade online because it looks like the colour range only contains nudes and almost neon brights. In the end I chose ‘Rebellious’, a bright berry pink which looks quite shocking in the pan but very pretty and fresh when blended out on the cheeks. It has a satin, very skin like looking finish but doesn’t contain any shimmer. Below I compared it to a few pink blushes from my collection but as you can see I don’t have anything very similar. Clinique Plum pop is more lilac-y but has the same satin finish, Revlon Haute Pink is warmer and more matte and the Sleek Pixie Pink is very similar to the Clinique offering but completely matte. Another exciting thing about this blush, besides its unique colour, is the texture. It’s a bit hard to the touch but so silky soft it reminds me of the Clinique Cheek pop blushes (I wrote about the curious powder to cream formula here). It’s not as creamy but also not powdery at all. It blends really easily and seamlessly and there’s almost no fall out when you swirl your brush in it. Many people reviewed the Marc Jacobs Shameless blushes negatively because of the sheer pigmentation. But I rather enjoy that I don’t have to worry about looking like a clown (and you really can with a bright shade like this) and I happily layer it till the desired effect. On the other hand, one thing I’m not so thrilled about is the staying power. Okay, it’s not that bad as it stays in place looking great for good 8 hours. But after that 8 hour mark it starts to fade and sometimes not very evenly. It might have something to do with the base I’m wearing but a few times it looked blotchy in the end of the day. It’s not really a deal breaker but in case I want my makeup to really look good after 10-12 hours I have to reach for something else and more failsafe. 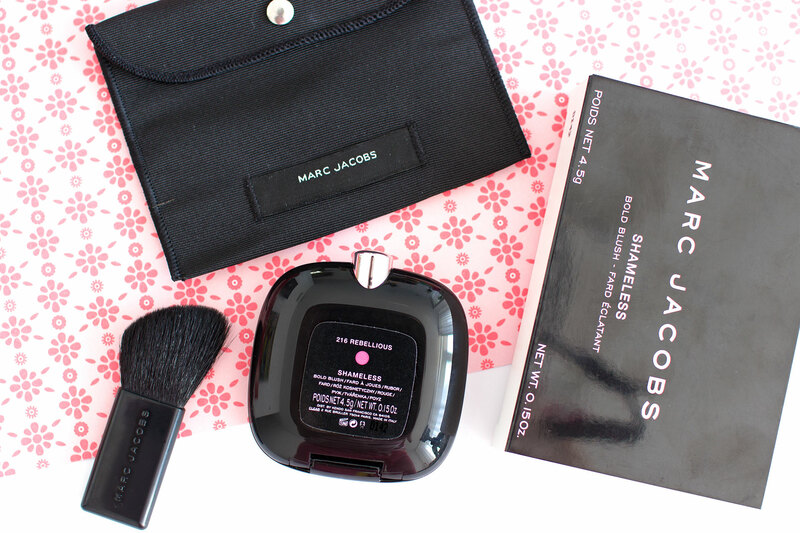 In conclusion, I’m really happy I picked up the Marc Jacobs Rebellious blush. The colour compliments my skin tone, is very unique in my collection and the texture is great. However I don’t think I will be picking up more of these because there are some formulas I love more (and their staying power). With that being said I’m pretty sure you wouldn’t regret your purchase either and I still encourage everyone to try it out. Do you have a MJ Shameless blush in your collection? They look soooo pretty don’t they? What a beautiful blush shade! I definitely want to buy the contour and highlight duo, though!